To properly care for a pool to adjust the pH level, add bleach or oxidized water is very important to know its volume, because all of these substances are preferably applied in a certain dosage. To calculate the required size in several easy mathematical formulas. The best way that allows you to more accurately calculate the volume of the pool is a measurement of water flow during the filling of the pool. To do this, just connect to the system with which you are the water in your artificial pond, the device is a water meter and watch the meter reading. On the counter you will see the volume of water in cubic meters. If you use this method for some reason cannot use the knowledge of mathematics. If your pool has a clear rectangular shape, measure its length and width (in meters) and multiply these numbers. You will receive a area of the pool. Then measure the height (depth) that you fill with pool water, and multiply it by the area. The result will be the volume of the pool in cubic meters. If the length, width and depth of the pool at different points vary, accurate volume measurement to produce much more complicated. You can do so. Measure with a tape each side of the pool and its depth in various places. Then take a sheet of paper in the cage and in a specific scale, draw a picture of the pool. For example, one cell is one meter. To find the area simply to count the number of cells. And if the cell is outlined by more than half, think of it as a unit, and if less than half, then zero. Projection of the pool depth can also be run on paper and calculate in the same way as the area occupied cells. In that case, if the pool resembles a complex geometrical figure, it also can be mentally divided into several simpler shapes and calculate the volume separately for each of them, and then add all the results together. In mathematics there are formulas to determine the area of triangle, trapezoid, parallelogram, rhombus and other shapes, and you can easily use the one which is more suitable to the shape of your pond. 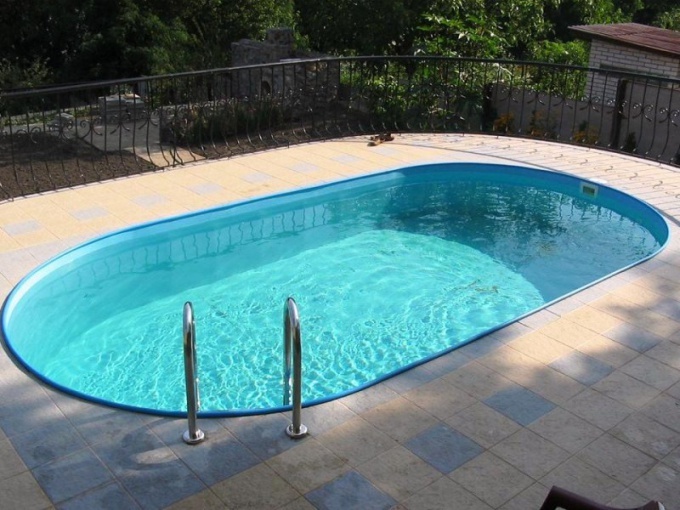 If your pool is round, in fact, you need to calculate the volume of a cylinder. It is the product of the area of the bottom of the pool to the height occupied by water. The bottom area is defined as the product of the constant PI (3,14) on the radius squared. Next, multiply the result by the depth of the pool and get the desired volume. To find the volume of an oval form pool, you also first need to calculate the area of the bottom. It is determined by the formula S=3,14 xAxB, where A is the length of the semimajor axis and is the length of the minor radius. Obtained by multiplying the product of the depth, you will get the desired volume.